Purpose: To evaluate fluoride release and biofilm formation on resin-based composites (RBCs) including surface pre-reacted glass ionomer (S-PRG) filler particles. Materials and Methods: Specimens were prepared from experimental RBCs including different fractions of S-PRG fillers (0/10/30/50/70% w/v). RBCs were light cured against mylar strips (MYL), and 50% of the specimens were additionally polished to a high gloss (POL). Surface roughness (SR), surface free energy (SFE) and fluoride release were determined. Streptococcus mutans biofilm formation (SMBF) was simulated for 48 h and 120 h; adherent viable biomass was assessed using an MTT-based assay. Results: The highest SR was identified for POL specimens manufactured from the RBC with a filler fraction of 70%. For all specimens and surface treatments, polishing caused an increase in surface free energy. For both MYL and POL specimens, increasing the filler fraction coincided with an increased release of fluoride; a higher release of fluoride was identified for POL specimens with filler fractions of 50% and 70% in comparison to their MYL counterparts. Release of fluoride was lower after 120 h than after 48 h. No differences in SMBF were identified between MYL and POL specimens with identical filler fractions after 48 h of biofilm formation; with increasing filler fractions, a tendency towards decreasing SMBF was observed. After 120 h, less SMBF was identified for POL specimens with filler fractions of 30%, 50% and 70% in comparison to corresponding MYL specimens. Conclusion: The inclusion of S-PRG fillers and an effective surface treatment may reduce biofilm formation on RBCs. Purpose: To evaluate the effect of different test parameters on the resin-dentin microshear bond strength (μSBS). Materials and Methods: A 1.5-mm-thick dentin disk was prepared in each of 140 human molars. The disks were divided into five groups to test the following variables: time of adhesive light polymerization (n = 20), storage time (n = 40), bonding area (n = 40), Tygon tube removal (n = 20), and time of composite placement (n = 20). The adhesives were applied and each specimen was subjected to μSBS testing. All fractured specimens were observed with SEM. The data from each experiment were subjected to two-way ANOVA and Tukey's test (α = 0.05). Results: The storage time, bonding area, and Tygon tube removal did not influence the μSBS. Higher μSBS values were found when empty Tygon tubes were filled after positioning and when the adhesive was light polymerized before Tygon tube placement (p < 0.05). Conclusions: Differences in test parameters affected the μSBS of adhesives, especially the time of adhesive light polymerization and composite placement. Does the Method of Caries Induction Influence the Bond Strength to Dentin of Primary Teeth? Purpose: To evaluate the effect of chemical and microbiological methods of caries induction on microtensile bond strength (μTBS) of current adhesive systems to primary dentin. Materials and Methods: Flat dentin surfaces from 36 primary molars were assigned to 3 groups according to the method of inducing caries-affected dentin: (1) control (sound dentin); (2) pH cycling; and (3) microbiological. In both methods, teeth were submitted to caries induction for 14 days, and the sound dentin was stored in distilled water for the same period. Specimens were then randomly reassigned according to adhesive system: a two-step etch-and-rinse adhesive (Adper Single Bond 2) or a two-step self-etching system (Clearfil SE Bond). Composite buildups were constructed and the teeth were sectioned to obtain bonded sticks (0.8 mm2) to be tested for microtensile bond strength. The μTBS means were analyzed by two-way ANOVA and Tukey's tests (α = 0.05). Failure mode was evaluated using a stereomicroscope (400X). Results: Both methods of caries induction resulted in lower μTBS values (with no significant difference between them) than those obtained for sound dentin. Adhesive systems showed similar bond strength values. The percentage of premature failure was higher in the microbiological group, regardless of adhesive system. Conclusion: Microbiological and pH-cycling methods are both suitable for simulating caries-affected dentin for bonding evaluations in primary teeth. Purpose: To test the hypothesis that the number of adhesive layers influences the adhesive interface properties under cariogenic challenge conditions using a Streptococcus mutans model. Materials and Methods: Bovine teeth (n = 90) were sectioned into blocks of 5 mm and divided into two groups for microleakage testing (n = 60) and tensile bond strength testing (n = 30). In each group, the samples were subdivided into subgroups according to the number of adhesive layers applied on the dentin: one (SB1), two (SB2), and three adhesive layers (SB3). The samples of the control groups were placed in BHI broth medium supplemented with 2% sucrose without microorganisms, and the experimental groups were submitted to Streptococcus mutans American Type Culture Collection (ATCC) for 5 days. For the tensile strength test, samples were sectioned into 1-mm-thick slices and submitted to a constant load of 0.5 mm/min in a universal testing machine. Fractured surfaces were analyzed and characterized as adhesive, cohesive, or mixed. The microleakage test was performed with silver nitrate solution. Results: In experimental groups, the tensile test revealed a statistically signifcant difference between the one- (18.59 ± 5.3) and three-layer (11.28 ± 5.0) groups (p < 0.001; ANOVA and Tukey's test). The adhesive failure mode was slightly more frequent in the one- (60%) and three-layer (80%) adhesive application groups. On the other hand, the microleakage levels of all experimental groups were statistically similar (Kruskal-Wallis; p > 0.05). Conclusion: The experimental conditions influenced tensile properties and failure modes of different adhesive interfaces; however, they did not influence microleakage. Purpose: The purpose of this study was to test the hypothesis that the pulp medication ferric sulphate (FS) may remain on primary dentin, affecting its microchemical structure and the bond strength of adhesives to primary dentin. Materials and Methods: The effects of FS and pre-bonding conditioning (37% phosphoric acid [PA] for 15 s or a self-etching primer, with or without the use of 2% chlorhexidine [CHX]) on FS-treated primary dentin were characterized using optical microscopy with Masson's and Perls' stains, variable-pressure SEM/energy-dispersive x-ray spectroscopy (VP-SEM/EDS), Fourier transform infrared spectroscopy (FT-IR), and x-ray diffraction. Ferric sulphate was applied for 30 s or 1 h for microchemical analysis. The adhesive interface and the bond strength were studied by VP-SEM/EDS and the μTBS test (1 mm2 bars, crosshead speed 0.5 mm/min), respectively. The study groups were: etch-and-rinse (E&R, Excite) adhesive (group 1); FS+E&R (group 2); FS+CHX+E&R (group 3); self-etching (SE, Adper Scotchbond) adhesive (group 4); FS+SE (group 5); FS+CHX+SE (group 6). Results: Ferric sulphate application produced demineralization, gypsum formation, and adsorption of Fe on the dentin surface, and it modified the collagen structure of primary dentin. There were no effects of FS on bond strength of the tested etch-and-rinse adhesive system. FS slightly reduced the bond strength between the primary dentin and the SE adhesive, and the values were not restored by CHX (group 4 = 17.58 ± 5.52 MPa > group 5 = 14.26 ± 7.08 MPa = group 6 = 13.96 ± 4.87 MPa). 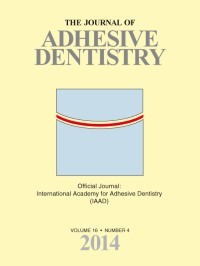 Conclusions: Ferric sulphate alters the microchemical structure of primary dentin and can impair the adhesive strength of some self-etching adhesives. Purpose: To evaluate the microtensile bond strength of indirect resin composite inlays to dentin using two cementation strategies, before and after mechanical aging. Materials and Methods: Standardized inlay cavities (bucco-lingual width: 3 mm; depth: 4 mm) were prepared in 32 human premolars. The teeth were embedded in self-curing acrylic resin up to 3 mm from the cementoenamel junction, impressions were made using a polyvinyl siloxane material, master dies were obtained using type 4 stone, and inlay composite resin restorations were fabricated (Sinfony, 3M ESPE). The teeth were randomly allocated into 4 groups according to the cementation strategy (conventional [C] and simplified [S]) and aging (mechanical cycling [MC] and not aged): C[G1]: Adper SingleBond + RelyX ARC without aging; CMC[G2]: conventional cementation + mechanical cycling (106 cycles, 88 N, 4 Hz, ± 37°C); S[G3]: self-adhesive resin cement (RelyX U-100) without aging; SMC[G4] self-adhesive cementation + mechanical cycling. Intaglio surfaces of composite inlays were treated by tribochemical silica coating in G1 and G2, while G3 and G4 received no surface treatment. Non-aged specimens were stored in a moist environment at ca 37°C for the same period as MC (3 days). Non-trimmed beam specimens (bonding area = 1 mm2) were produced by serial cutting, and microtensile testing was performed (0.5 mm/min). Results: Two-way ANOVA showed that the microtensile bond strength was affected only by cementation strategy (p < 0.0001). Tukey's test showed that groups G1 (35.1 ± 9.1) and G2 (32.7 ± 10.7) presented significantly higher bond strength values than G3 (8.7 ± 6.3) and G4 (5.2 ± 4.6). Conclusion: The use of a conventional adhesive technique and tribochemical silica coating resulted in higher μTBS than the one-step simplified cementation, even after mechanical cycling. El-Korashy, Dalia I. / El-Refai, Dina A. Purpose: To evaluate the effect of different chemomechanical surface treatments of zirconia on fracture toughness, flexural strength, bond strength of zirconia to composite cement, surface topography, and phase transformation. Materials and Methods: Pre-sintered yttrium-stabilized zirconium oxide blocks (in Coris ZI) were used. Specimens were prepared using a milling machine (Cerec InLab). Specimens for each testing procedure were classified into 6 groups according to the surface treatment applied: group 1: air-borne particle abrasion (ABA); group 2: silica coating; group 3: hot etching solution; group 4: hot etching solution followed by ABA; group V: hot etching solution followed by silica coating; group 6: control. Fracture toughness, biaxial flexural strength, and shear bond strength were tested using a universal testing machine. Surface topography was evaluated using a surface roughness tester and scanning electron microscope. Phase transformation was examined using x-ray diffraction analysis. Data were subjected to one-way ANOVA followed by Tukey's HSD multiple comparisons test at p < 0.05. The strength reliability was analyzed using the Weibull distribution. Results: Silica coating revealed the highest mean fracture toughness (9.18 ± 0.11 MPa•m1/2), biaxial flexural strength (1614.1 ± 124.6 MPa), and bond strength value (31.5 ± 5.06 MPa) among all tested groups. Surface topography evaluation revealed variations among the different surface-treated groups. Conclusions: Silica coating induced significant improvement in the tested properties compared to other treatments. The use of combined treatment of hot etching solution followed by either air-borne particle abrasion or silica coating of the zirconia surface did not provide an added advantage over silica coating alone. Purpose: To evaluate the effect of Er,Cr:YSGG laser treatment on microshear bond strength of zirconia to resin cement before and after sintering. Materials and Methods: Ninety pre-sintered yttrium-stabilized tetragonal zirconia specimens (4 × 3 × 2 mm) were divided into 6 groups (n = 15). In group C, sintered zirconia was not treated (control group). In groups AS2 and AS3, sintered zirconia blocks were irradiated by Er,Cr:YSGG using a power of 2 and 3 W, respectively. Groups PS2 and PS3 consisted of pre-sintered blocks conditioned by Er,Cr:YSGG at 2 and 3 W, respectively. In group AA, sintered zirconia was air abraded with 50-μm alumina powder. One block was made using the same preparations as mentioned above and was morphologically assessed by SEM. Microcylinders of Panavia F 2.0 were placed on the treated surface of the groups. Samples were incubated at 37°C and 98% humidity for 48 h and then subjected to microshear bond strength testing. The mode of failure was evaluated. Data were analyzed by one-way ANOVA and Tukey's HSD test (p < 0.05). Results: There was a statistically significant difference between group AA and the others (p < 0.0001). A significant difference was also noted between groups AS3 and C (p = 0.031). Complete surface roughness was seen in group AA and the bond failure was mostly cohesive, while in laser-treated groups, the surfaces roughness was much lower vs other groups, and the mode of failure was mostly adhesive. Conclusion: Laser treatment of pre-sintered Y-TZP cannot be recommended for improving the bond. Although sandblasting of sintered Y-TZP yielded better results than the rest of the groups, 3 W power after sintering can also be effective in enhancing the bonding strength of resin cement to zirconia. Purpose: To test the impact of mechanical and chemical treatments of PEEK on surface roughness (SR), surface free energy (SFE), and tensile bond strength (TBS) to veneering resin composites. Materials and Methods: PEEK specimens (N = 680) were fabricated and divided into treatment groups (n = 170/group): 1. air abrasion (AIA); 2. etching with piranha solution (PIS); 3. air abrasion + piranha acid etching (AIP); and 4. no treatment (NO). Ten specimens of each treatment group were assessed with a contact angle measuring device and profilometer to determine SFE and SR, respectively. The remaining 160 specimens of each group were divided into subgroups according to coupling method (n = 32/subgroup): 1. Monobond Plus/ Heliobond (MH); 2. Visio.link (VL); 3. Clearfil Ceramic Primer (CCP); 4. Signum PEEK Bond (SPB); and 5. control, no coupling (CG). Specimens were veneered using Signum Composite/SiCo or Signum Ceramis/SiCe (both: n = 16), incubated in water (60 days at 37°C) and thermocycled (5000 cycles of 5°C/55°C). TBS was measured and data analyzed by three- and one-way ANOVA, Kruskal-Wallis and Mann-Whitney tests (p < 0.05). Results: A significant effect of surface treatment (p < 0.001) and coupling agent application (p < 0.001) on TBS was observed. AIA specimens with/without PIS showed the highest SFE, SR, and TBS. No differences were measured between PIS and NO, and between AIA and AIP. When no coupling agent was used, no adhesion was obtained. CCP resulted in low adhesion values, whereas MH, SPB, and VL exhibited increased TBS. No significant impact of the veneering resin composite on TBS was found (p = 0.424). Conclusion: AIA and AIP combined with VL, SPB, and MH can be recommended for clinical use.